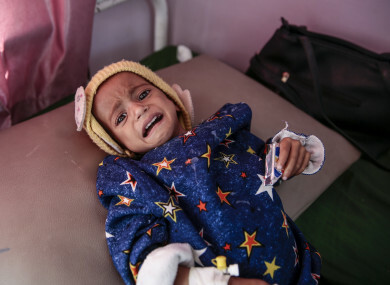 UP TO 85,000 children under the age of five may have died from starvation or disease since 2015 in war-ravaged Yemen, humanitarian organisation Save the Children said Wednesday. It said the estimate was based on data compiled by the United Nations, which has warned that up to 14 million people are at risk of famine in Yemen, where Saudi-backed forces are battling Huthi rebels. “For every child killed by bombs and bullets, dozens are starving to death and it’s entirely preventable,” said Tamer Kirolos, Save the Children’s country director in Yemen. “Children who die in this way suffer immensely as their vital organ functions slow down and eventually stop,” he said. Hodeida port, the entry point for some 80% of food imports and aid into Yemen, has been under blockade by the Saudi-led coalition backing the government since last year. It also reported a ”dramatic increase” in air strikes on the battleground city of Hodeida. “In the past few weeks there have been hundreds of air strikes in and around Hodeida, endangering the lives of an estimated 150,000 children still trapped in the city. “Save the Children is calling for an immediate end to the fighting so no more lives are lost,” Kirolos said. Email “'Some are too frail to cry': Up to 85,000 children under five have died since start of 2015 Yemen war”. Feedback on “'Some are too frail to cry': Up to 85,000 children under five have died since start of 2015 Yemen war”.